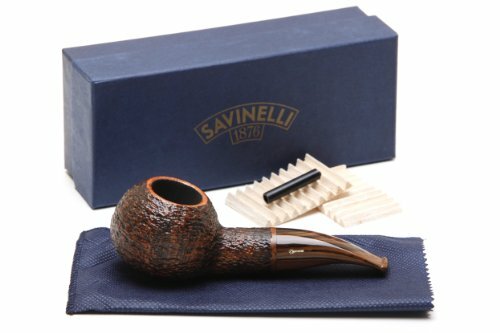 Savinelli Tundra Brownblast EX 320 Tobacco Pipe by Savinelli at Serious Jones. Hurry! Limited time offer. Offer valid only while supplies last. Brand: Savinelli Model: Tundra Style: 320 EX Shape: Author Length: 5.45 in. / 154.51 mm. Height: 1.71 in. / 43.43 mm. Weight: 2.59 oz. / 73.43 g.
Brand: Savinelli Model: Tundra Style: 320 EX Shape: Author Length: 5.45 in. / 154.51 mm. Height: 1.71 in. / 43.43 mm. Weight: 2.59 oz. / 73.43 g. Bowl Depth: 1.37 in. / 34.80 mm. Bowl Outside Diameter: 2.16 in. / 54.86 mm. Bowl Inside Diameter: 0.97 in. / 24.64 mm. Filter: 6mm Finish: Rustic Bowl Material: Briar Stem Material: Acrylic Package: Box Country: Italy Convertible: Yes *Pipe measurements are approximate **Pipe pictures are not of actual pipe you may receive.